I’ve been noticing lately that I say ‘I hope’ a lot. Every time someone tells me things are going to be fine .. I say I hope. It’s not just something I say to end a conversation, it’s just something I say because I want to convey that I’ve done everything I can and I have nothing left to do but hope. Things do have a way of working themselves out in general. It’s not like you live in a state of utter confusion all the time and that things are always in flux. Sooner or later things settle down. If you’ve been following this blog you know that things are clearly getting better each day for my family and I. If not back to normal, in the right direction. And it made me think about hope. This hope is a very tricky thing. It can be really misleading when we don’t understand our place and role in helping create hope. I was at the Shiva temple at Bangalore over the weekend. I’d seen boards saying it’s a must see sight in the city. What kind of temple advertises itself as a must see attraction on a big billboard. Never seen anything like it and I come from Chennai .. the city of temples. So I know a thing or two about temples. I’ve danced for 23 years of my life, performing from one temple to another. 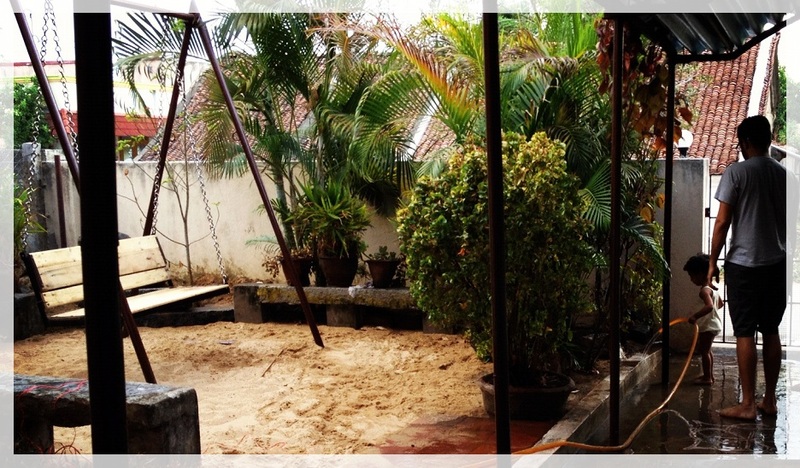 My dad left my home, city and everything else to go settle in his village to rebuild his ancestral temple. I have a long history with temples. But the photograph on the billboard looked really interesting. 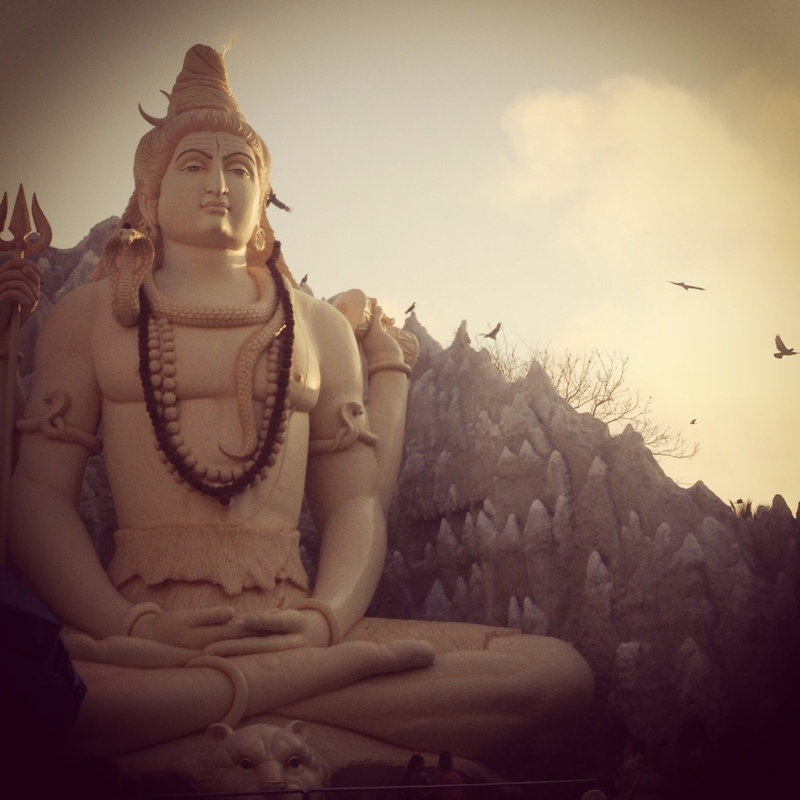 I had to go see this huge Shiva deity. So I took my mom, husband, little A with a bunch of college kids from my dad’s village who had grown up with our family and here in B’lore to help us unpack. Hope was on sale at this temple. You could buy it in the form of Rs.150 ($3) tickets to each cave that had been designed to look like the ones in the North with deities in them. You could buy it in the form of several Rs. 100 in exchange for 108 tokens that you dropped along the way to the deity. 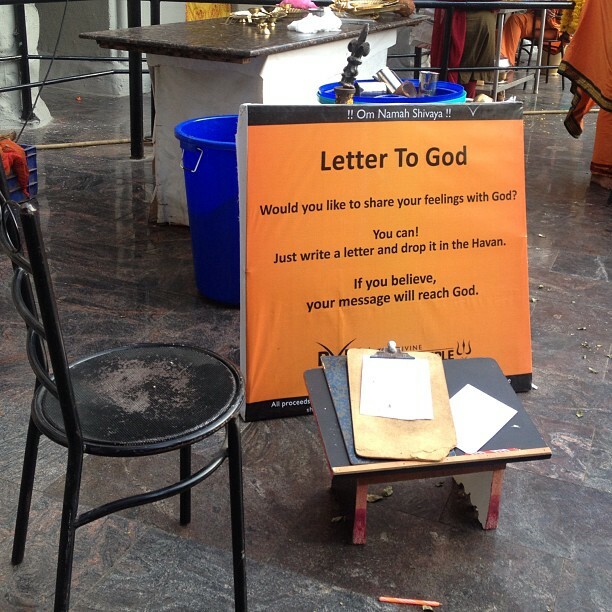 You could write letters to God. You could buy tickets to take pictures that can remind you of hope in the form of the deity. 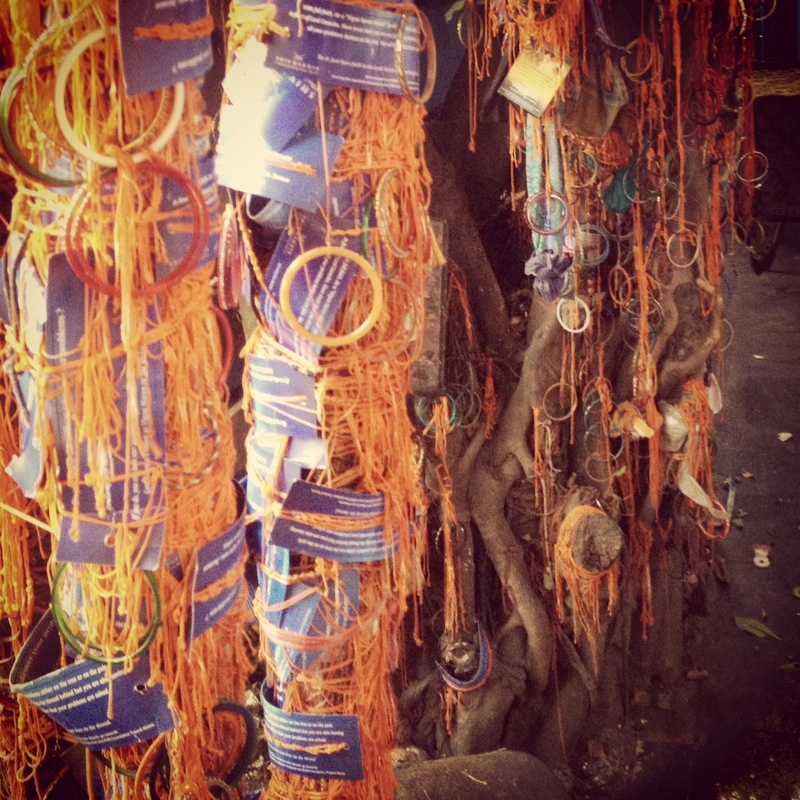 You could even buy tickets with holy threads that you tie to the tree. A tree of hope. Literally! The main deity was absolutely stunning. I felt like I could sit there for a long time just staring at this beautiful work of art. Peace … it’s what I’d been yearning since I moved. Moments of quiet and peace. In a loud, busy temple this is hard to find. I hit jackpot this day having come in early around 4.30 pm. The place was not filled with the sound of people. I sat there and tried to focus on the deity in front of me that I started gaping at .. but my eyes kept flickering back to the ‘write a letter to God’ sign and another that read ‘miracles happen when you touch the water in the pond’. Hope. There it was. On sale. Clearly, it’s working. I’ve heard this place draws a lot of people. Buying the ability to write and talk to God at a temple must be like going to the shrink (I completely disagree with this but I’m humoring myself for the moment! Maybe just maybe). You can say what you want to say, write what you want to write … let it all out. I’m not certain you get the same kind of conversations and analysis back at a temple … but who knows. Maybe. Maybe I don’t know how to get into a conversation with Gods at temples anymore. Over the years I started getting the feeling it’s kind of one way. I used to be a religious God fearing kid before I went away to do my Masters. Then I read a lot .. traveled .. studied people for a living .. married a neuroscientist and that was that – things changed. I’m not going into the details of my opinion on organized religion here. But I can tell you I’m sure I’m not paying to buy hope. I’m not paying to talk about hope to this thing that looked to me like a beautiful looking magical shrink. (I really do love both psychologists and psychiatrists .. so making this comparison pains me but I’m exploring the possibility of a similarity in how people feel when they get to talk to someone and tell them everything without fear or judgement). Hope is meaningless to me unless it follows a decision I made. The decision I made is useless unless it came out of a lot of analysis. I’ve been kicking myself for several things I did or didn’t do the first two years of my little girl’s life. I’ve been questioning a few decisions I made those two years. The school 1 nightmare just ended. We ended her school abruptly and have admission at another. Going from a nightmare of a school experience can be quite daunting. What if my next choice of school is screwed up too? Do I go the route of a home care or this big fun school with a wonderful infrastructure that seems more like her style. I have spent the last 2 days going over this over and over again. What if I screw up again? But I did what I could … analyzed the options with my husband, did the research I could and picked the school I thought would end this school misery .. these nightmares and moaning about not wanting to go to school (yes it’s that bad!). I was hopeless. She’s been through soooooo much this little girl, these past 6 weeks. I wanted this to end. I wasn’t going to write a letter to God. I did want to appreciate some art at that temple to temporarily distract myself. But I analyzed, made a decision and then hoped it was the right one. And while in the middle of all that hoping had taken a trip to the temple. Hope without responsible human action is meaningless. I’m not suggesting that we all stop going to temples or seek peace and hope in God … I’m suggesting we do what we’re supposed to do before we get there. I’m not sure I’ll go back to this temple again. While I do want to go back and see the big Shiva deity again for how gorgeous he looks, to enjoy the beautiful work of art and possibly have a few more peaceful quiet minutes like I do when confronted with beauty .. this place is too distracting now. I can’t not stare at the signs. I think they’ve lost a ‘customer’. They ruined what could have been a trip of peace and quiet for me. They ruined my ability to assimilate my analysis and decisions that day and think of hope. I wish they’d stop selling hope the way they are today. I hope the Christian channel on TV stops selling miracles the way they do. I hope organized religion stops selling hope. It’s hope packaged and sold at the price of the human ability to think! ← The empty house saga ends in a day! These scenes will remain etched in my mind. Thank you, that was brilliant! 1. who said you have no fear of judgment when you talk to a shrink? that sh*t is hard. 2. i wonder how baby A would do in a montessori environment? you mentioned that there are a couple options there, and it seems like your little free spirit might do well with that unstructured, self-guided approach. whatever you guys are working out, i have such total confidence that a year from now you’ll be beyond this issue and on to other things. for better or for worse. 😉 love that kid though, and really do feel an odd-but-special connection to who she is. 3. i had a college professor who argued that hope was evil, and referenced pandora’s box as a point evidence. pandora opened the container and all the evils of the world escaped and spread across the land…except for hope. it remained clinging to the container. he said people always hear this story and often interpret it as “there’s always hope.” he took a different view: “what the hell was hope doing there in the first place? !” i always thought that was funny—and interesting. 4. i often find myself really wishing i could buy in whole-heartedly to some particular religion. i want simple answers that explain the challenges we face in life, or at least offer some assurance that there is some master plan and that if i just surrender myself to that plan, everything will be fine. i guess that’s the kind of peace i’m working on achieving in my own ways, but the usual religious narratives are just so simple…i often wish i could get some of those beliefs to really sink in and take hold. On 2. I am sure she’ll thrive in Montessori precisely for the reason you mention here. That’s why I even considered it having missed that the first time. But I think there’s a problem with most kids in these smaller Montessori types – they are almost always younger than her and she gets really bored when she’s around younger kids. She needs to be challenged all the time. But I think we’ve hit jackpot (famous last words!) with this new place we saw. Even more free spirit options and lots of space and things for Aditi to do. She was at home when we went to see the place and refused to leave. So let’s see. On 3. That is such a cooool story! What a lovely angle! I barely had professors that could say the words Pandora’s box! Love you babe! I really do hope the little free spirit comes around sooner than later and we look back and laugh at ourselves silly! Thanks 🙂 you’ve been writing some really nice ones yourself. I’m kind of behind on Ur reblogs. A Montessori class kids within a 3 year age range all doing stuff together and by themselves.And each child does what he/she is capable of -the Montessori principle is “Follow the child”. So even if the kids are younger, if they can “work” on a task, they get to do it. Chronological age does not matter much here.And kids learn of each other -by watching the older ones, and helping the younger ones. You will never find all the kids being told to do the same thing in the class- as they are all treated such-as individuals. I’m guessing you meant this comment to go under the school post as well. Can’t figure out how to move it but I understand the Montessori method and am familiar with it. In fact, I looked for them in our neighborhood. The ones with the decent reviews were all farther away in Koramangala. So we ended up picking a school from the 15 we ended up visiting in the area. Indiranagar is supposed to be really good so I was kind of surprised at the quality. When I finally found a decent Montessori one through my friends, I’d already discovered Neev.